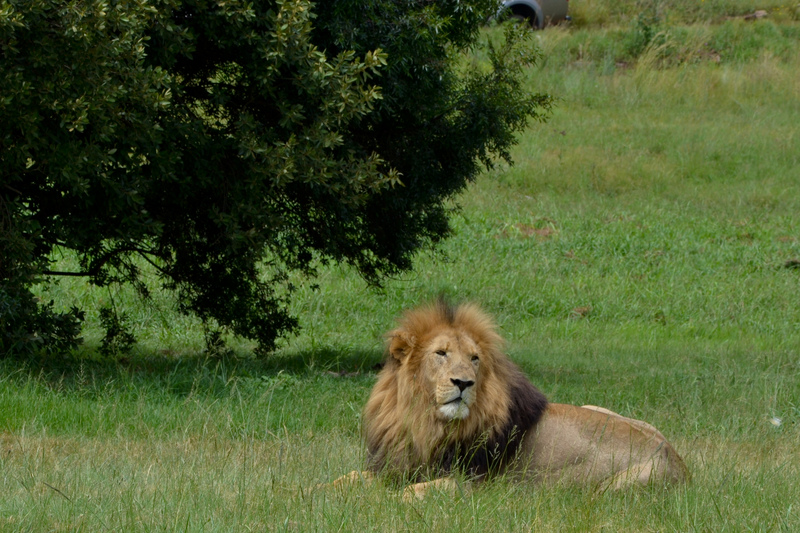 Over the past few months a number of my expat friends have blogged about the Rhino & Lion park just outside Johannesburg. Having lived in South Africa for 18 years I have seen my fair share of wildlife in proper game reserves so I was not about to rush to a park where the animals are in enclosures or so accustomed to humans that they barely flinch at the sight of 100 cars. But since my cousin from Poland was coming, and there is a cave on the property of the park too, we decided to give it a go. 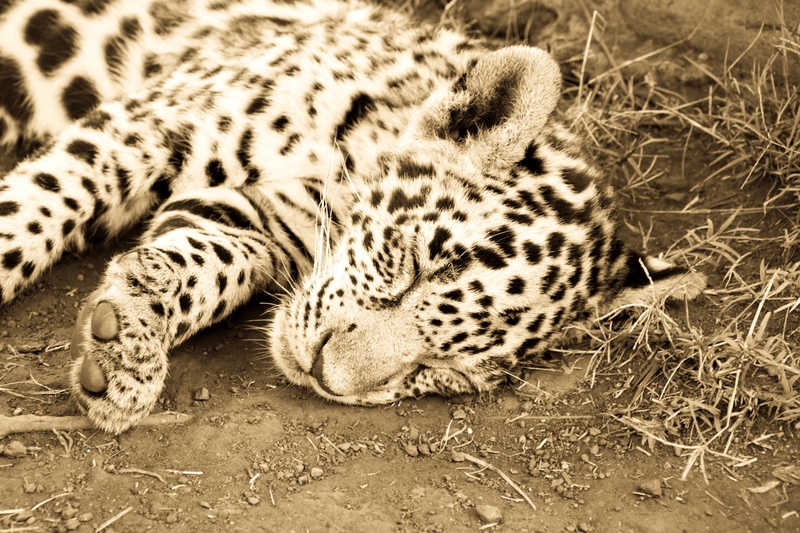 Of course it is by no means a replacement in any way to the amazing game reserves like Hluhluwe and Kruger, but it made for a fun day out and it is a great alternative to the usual hang-around-in-a-mall-drinking-coffee. There were five of us in the car and we laughed and joked and enjoyed the beautiful weather. 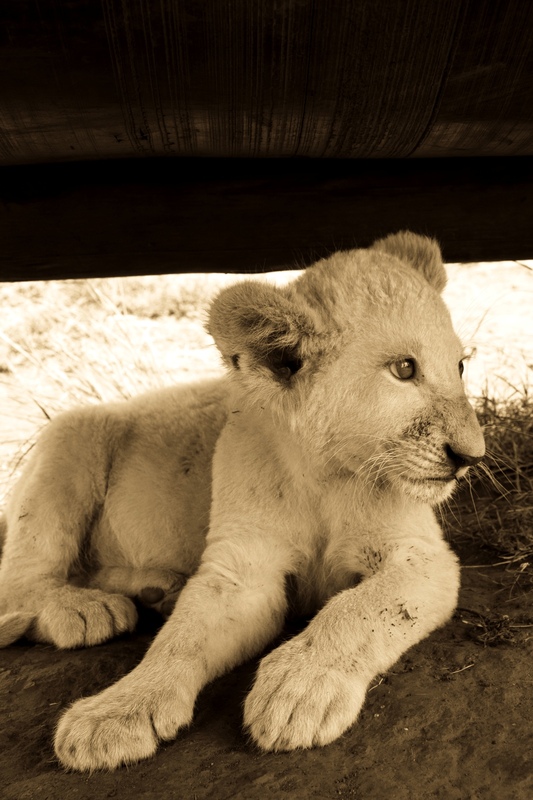 We also got to play with baby lions and baby jaguars and you can’t do that at the Kruger – I’m afraid that if I had more money than brains I would be completely tempted to buy one of the baby Jaguars, they were adorable. On a photography note I can’t say that I enjoy shooting wildlife very much. I guess I have just seen too many breathtaking photos in the National Geographic and other publications to ever be satisfied with my little efforts. Equipment, luck, and weather aside, if you’re not a professional you’re unlikely to be close enough for long enough to get that perfect shot. One the plus side my new Nikon 18-105mm lens performed quite well and I even got fairly sharp photos when shooting from a distance. Most of these photos were actually taken through a fence. 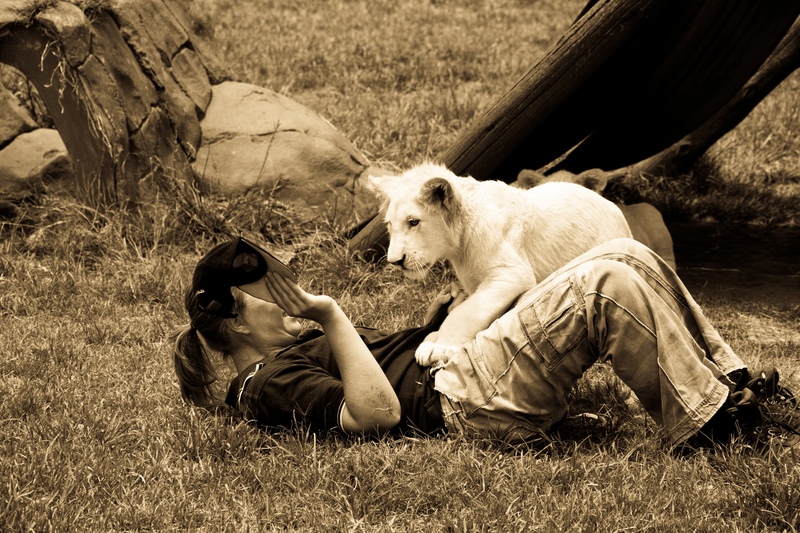 While most of the animals slept through the heat, a group of 6-month-old white lions decided it was time to play with one of the handlers. 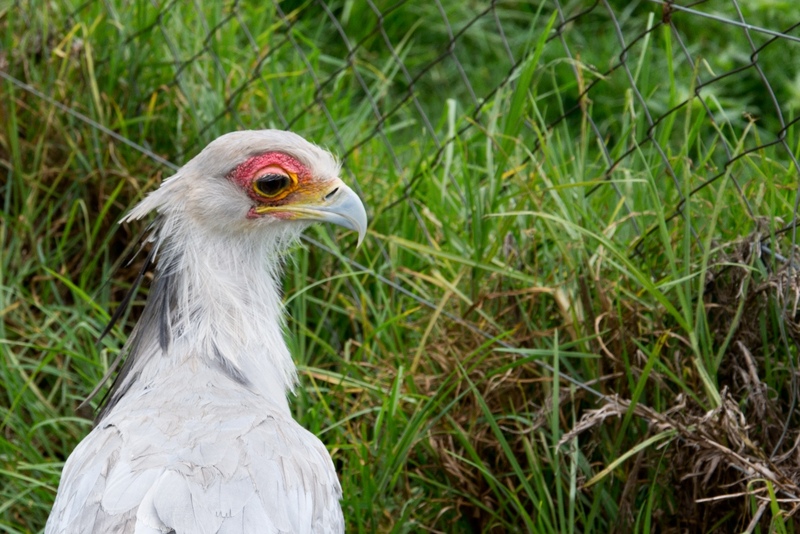 This Secretary Bird would not stop moving around so I battled to get a perfectly focused image. 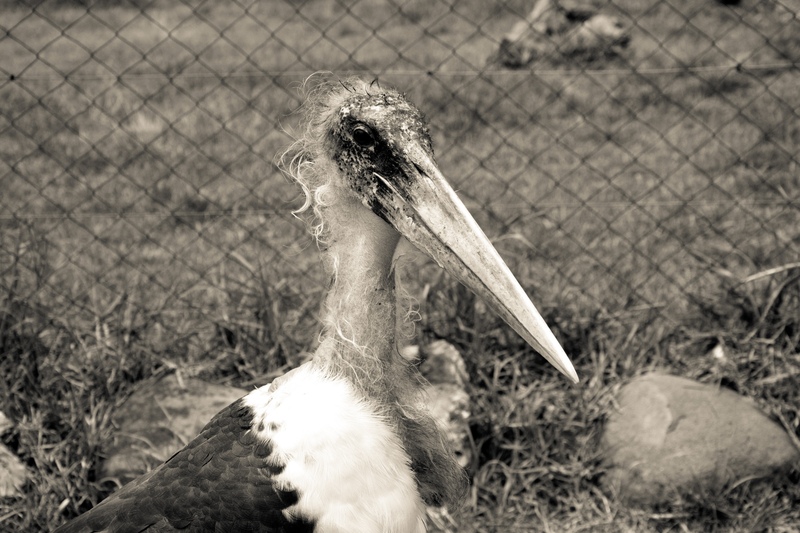 The Marabou Stork - one of the candidates for ugliest bird out there. On the plus side there were lots of them and they were very happy to have their photos taken. Who can resist those big paws and ears? Entrada anterior There’s a good dog, look at the camera! also, i agree you really need to be close and have a telephoto lens. also if you can get the animal looking at you it is the best! I’ve never used a proper telephoto lens but my hunch is that the reason why they are so expensive is because they can zoom without causing blur or the out-of-focus problem. Shooting with a a 55-200 in the past (which i didn’t use yesterday because I hate it) I found that even if i rested against the car the photos came out blurred. The lens I used yesterday was better but I could also see its limitations. OMG…I so love the big cats! I don’t know why, maybe it’s just my mood being unstable but thos images pulled some tears and I almost broke down o.O (Funny thing for a man to say). 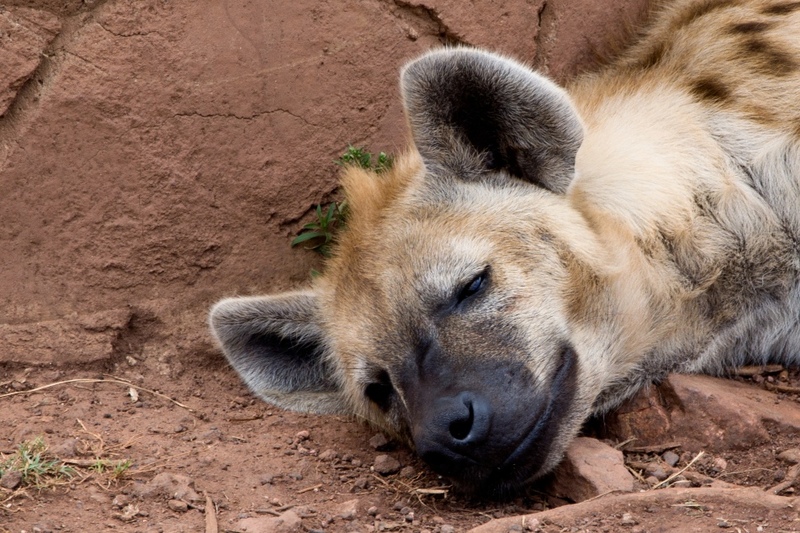 I try to work on my photographic skills every once in a blue moon when me and the fam visit game parks (More likely because my dad has such a big interest in it…he has tens and tens of books on photography, which is now mostly absolete due to the digital era). 1. Perspective is very important, three quarter views gives a sense of depth and the dimensions of the subject. 2. Using lighting and shadows to highlight the contours of the subject (This, I have a real problem with). 3. Try to get the subject in center frame and if there is more than one subject, balance them in the scene (one on each side for example). 4. Find the focul point, either the face or where the action is at, and use this to refine the center of the scene. 5. When doing close-ups, blurring is inevitable, therefor, focus on the subject and you get a “soft and fuzzy” background as a bonus, instead of it being seen as blurring.